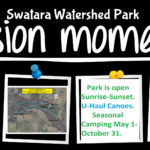 Swatara Watershed Park is a 33.69-acre parcel along the Swatara Creek at 1929 Blacks Bridge Road, Annville (East Hanover Township, Lebanon County PA). In addition to a boat access, the site adjoins two historic Union Canal locks; and has been improved with a 960 square foot pavilion (Pavilion Use Agreement); a 240 square foot stilted office with both a 200 Amp electrical service and a 120 square foot porch anchored on 3’6” concrete pilings below the frost line; a permeable parking lot, an approved public water source with a flow rate of 25 gallons per minute at the pump house; Primitive camping; and 3,341 feet of riparian buffer that shades and cools the Swatara, slows evaporation, and limits runoff and erosion. 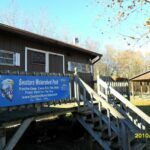 Because we start or end our sojourn and River cleanup at this site each year, SWA considers this site an essential hub in the wheel of the Swatara Water Trail, which is recognized by both PA and the nation, and connects to the Captain John Smith Water Trail. A long-term goal is to become part of an inter-county trail system that could link to the proposed north-south rail-trail and east-west rail-trail linking Berks, Dauphin, Lebanon, and Schuylkill counties. The property is open to the public from sunrise to sunset. May 16, 2006 a Lebanon County Comprehensive Task Force meeting revealed that $1 invested in parks and recreation returns $1.36 in local economic spending; investment in parks and recreation reduces juvenile delinquency; 1 mile walked per day increases your lifespan by 20 minutes; and recreation brings people together and builds a sense of community. Ann Yost presented the inventory of recreation and open space sites in Lebanon County. 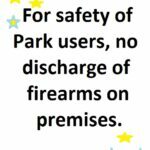 She stated that there is a wide variety of recreation sites, including parks, campgrounds, and natural areas in the county. She estimated 882 acres of public municipal parkland among 47 municipal parks and 2 county-owned sites. This equates to 7.33 acres of parkland per 1,000 residents. 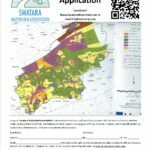 The national guideline is 10 acres per 1,000 residents. She noted that more parkland is needed to meet the national guideline, however quality should come first. The national guideline has been in place for over 30 years and should be considered a minimum standard as trends and participation in recreation activities have changed significantly over that time. Ann indicated that there are three rail trail segments in Lebanon County—the Lebanon Valley Rail Trail, The Stoney Valley Railroad Grade in the state game lands, and the trail in the Swatara State Park—as well as the Quittie Trail. She mentioned opportunities for greenways, with or without trails, exist along waterways and for rail-trail conversions; and the extensive natural resources—the mountains, the stream corridors—as well as historic sites and linear corridors for passive recreation. These resources are often the focus of county or regional parks; local parks tend to focus on active or athletic activities. Counties are also increasingly involved in trail networks. Purchase will maintain a permanent sustainable riparian buffer along the Swatara Creek. TMDL Implementation – Non-point source reductions occured with SWA eliminated a golf. Needs also include reducing flooding losses, improving citizen health, reducing the crime rate, and reducing sprawl. Benefits include low repair costs, lower health care costs, improved safety, and less time in the car. These goals can be accomplished through creation of trails, preservation of the floodplain, and creation of a greenway. Hershey Trust, Dauphin County Parks, the Swatara Watershed Association’s Rivers Conservation Plan, and Lebanon County Comprehensive plan all document the need for permanent Creek access, parks, and protected floodplains and riparian buffers along the Swatara Creek. SWA has obtained letters of support from the host municpality–East Hanover Township; Lebanon County Commissioners; Lebanon Valley Economic Development Corporation; Lebanon County Planning Department; Lebanon Valley Conservancy; Lebanon County Conservation District; and the Capital Area RC&D. The site expands County park systems, connects trails with neighboring counties, and provides a wetland bank. Technical support like GIS mapping is provided by these organizations. Throughout the County, municipalities are often cooperative with providing heavy equipment as needed. Further, canoe trips from the property usually end at Boat House Road Park, Derry Township, Dauphin County, which documents multi-county importance of this site. A-Build and Maintain Attractive Communities by empowering East Hanover Township; Berks, Lebanon and Dauphin counties; regional planning entities like the Capital Resource Conservation and Development Council; the state and nation to conserve natural and heritage resources and promote recreational activities through cooperative planning; creating and enhancing greenways, and as a future connection or link to an already established segment of greenways. B: Promote statewide land conservation: Riparian buffers along the Swatara Creek are desirable, and the golf course was not be the best use of a portion of the property. A native plant nursery, wetland bank, farming, or expanded riparian buffer may improve the site by reducing the use of chemicals and irrigation. Further, preservation of this property helps us to reduce the loss of open space; preserve and enhance a large forested watershed and riparian corridor; preserve and enhance biologically sensitive wetlands; protect floodplains, enhance the Chesapeake Bay; and expand outdoor recreation and outdoor learning opportunities. Farming and managed timber help to make this property self-sustaining far into the future. 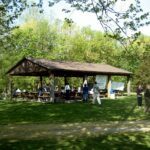 The management plan developed as part of the 2000 Swatara Creek Greenway and River Conservation Plan, which encompasses the Dauphin County Parks and Hershey Trust plans, provides a comprehensive blueprint for developing a greenway along Swatara Creek in Dauphin County. Implementing these options is important for protecting valuable riparian areas and enhancing the recreational and aesthetic features along the stream. The project will protect the natural and scenic qualities of Swatara Creek by restricting development. The 2007 Lebanon County comprehensive plan also recognizes the need for additional parks, recreation and open space. 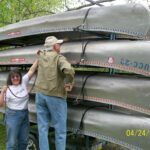 Canoeists: Thinking about a float today? 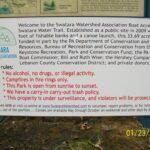 Check water depth Swatara River Page. Guidelines: If Harper’s USGS gauge is rising from 3.5 toward 4′, water is too high even for experienced paddlers to launch; if below .3’ at Harper’s, water is too low to launch. Beginners should not launch if Swatara is over 2.6′. In general, ideal conditions are close to 2′. 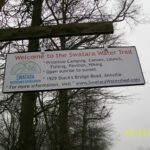 The further above two feet the Swatara rises, the faster the ride–also increasing the danger factor. The further below two feet the Swatara drops, the slower the ride, and the more times you’ll have to drag you canoe through shallow areas. Kayaks can clear more areas than canoes.